· Unflattering hot spots on the skins? No, these aren’t diseases, but rather symptoms of on-camera flash. While on-camera flash is handy and a no-brainer to use, it’s typically not the most flattering to your subjects. And well…isn’t that what photography is all about…taking beautiful photos of friends and family? Well now there’s help, thanks to Professor Kobre and his ultimately easy-to-use Lightscoop. If you’ve got a DSLR with built-in flash (think Nikon, Canon, Pentax, Sigma, Sony, Olympus or Fuji) then you are a candidate for the Lightscoop. 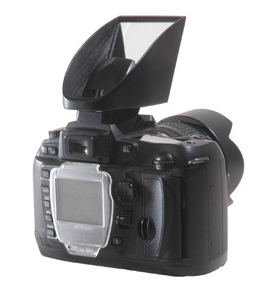 This little plastic accessory slips in your camera-top hotshoe and by way of a mirror, reflects your flash 90 degrees. The light can be bounced off a ceiling or wall to provide a wide, soft, attractive illumination. Gone are the harsh shadows and red-eye so often encountered. What you’ll discover, is a softly lit portrait with none of those annoying hard shadows just off to the side of your subjects face. Andrew, a photographer from North Royalton, tried out my Lightscoop and said he was very satisfied with the immediate improvement. He liked the fact that it fit very securely into his hotshoe and had no worries about it coming loose. He also liked the soft-touch protective pouch that came with it. His biggest concern was finding a spot for it in his already crowded camera bag. You can order a Lightscoop directly from the manufacture in one of two models – either standard (clear mirror) or a warming type (with a tinted mirror) from the Lightscoop website. For $29.95 its one of the bigger bangs for the buck you’ll find in photography. $55 gets you one of each.